-This past February I was contacted by filmmaker Nicholas Bongiomo, who was looking for a Native American actor to play a part in his documentary film “Juggernaut.” I’m not native, but I play one on TV (HA! ), so he reached out to me asking if I would be interested in playing the role of Joseph Crow. After going over some stuff and working over some details, I got on-board. Filming was to happen at the Fort Hill Cemetery in Auburn, NY towards the end of April, but it was postponed until yesterday. It’s been awhile since I’ve been to Auburn, but it seemed easier than the last time I remembered. Here’s a surprise-I actually arrived in the area before anyone else did-isn’t that one of the signs of The Apocalypse? (HA!) 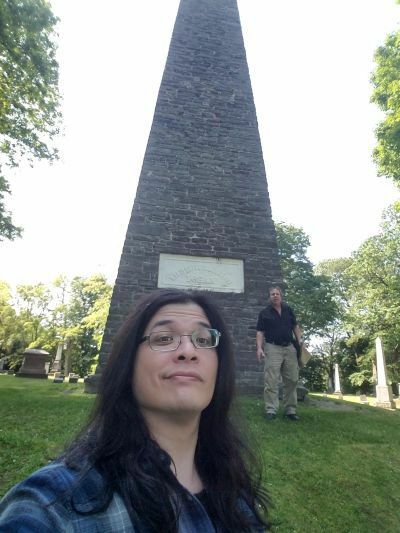 🙂 It didn’t take us long to find the obelisk of Chief Logan of The Cayuga-which was in the scene we were filming. I met up with Nick and his camera man William Hudson and we started going over details for filming. -The scene starts with a voice over from me and then into the acting. The decision was made to have some of that voice over dialogue be in the scene the night before. I got thru it OK. We did several takes from various angles and hopefully the wind wasn’t blowing my hair (which was down) too much into my face 🙂 The temperature was going up as we went along so that was a factor as well. Nick and William (who, for some reason, I was initially calling him “Greg.”) were easy to work with it and we got thru all the shots needed. -I always have a great time when filming and this was no exception. Thanks to both Nick and William for having me. “Juggernaut” has been a work in progress for awhile and I was told it might be done in released some time in 2018. This entry was posted in ACTING, FILMS and tagged acting, Auburn, Cayuga, Chief Logan, cny, documentary, Fort Hill Cemetery, IBM, Joseph Crow, Juggernaut, Ley Lines, Monitoring Wells, native american, Nicholas Bongiomo, NY, obelisk, wayne w johnson, William Hudson, WWJ. Bookmark the permalink.